Citation Information: J Clin Invest. 2010;120(7):2627-2634. https://doi.org/10.1172/JCI42304. Rates of graft rejection are high among recipients of heart transplants. The onset and progression of clinically significant heart transplant rejection are currently monitored by serial biopsy, but this approach is highly invasive and lacks sensitivity. Here, we have developed what we believe to be a new technique to measure organ rejection noninvasively that involves the exploration of tissue-infiltrating leukocytes as biomarker sources for diagnostic imaging. Specifically, we profiled the myeloid response in a murine model of heart transplantation with the aim of defining and validating an imaging signature of graft rejection. Ly-6Chi monocytes, which promote inflammation, accumulated progressively in allografts but only transiently in isografts. 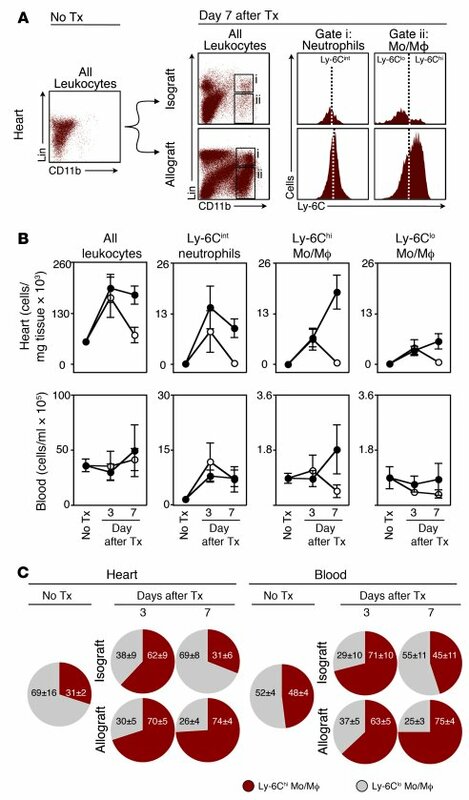 Ly-6Clo monocytes, which help resolve inflammation, did not accumulate, although they composed the majority of the few remaining monocytes in isografts. The persistence of Ly-6Chi monocytes in allografts prompted us to screen for a Ly-6Chi monocyte–associated imaging marker. Low-density array data revealed that Ly-6Chi monocytes express 10-fold higher levels of myeloperoxidase (MPO) than Ly-6Clo monocytes. Noninvasive magnetic resonance imaging of MPO with an MPO-activatable Gd-chelate revealed a spatially defined T1-weighted signal in rejected allografts but not in isografts or MPO-deficient allograft recipients. Flow cytometry, enzymography, and histology validated the approach by mapping MPO activity to Ly-6Chi monocytes and neutrophils. Thus, MPO imaging represents a potential alternative to the current invasive clinical standard by which transplants are monitored. Myeloid cell profile in transplant rejection. (A) Flow cytometric analysis of cell suspensions retrieved from native hearts and iso- and allografted hearts 7 days after transplantation. Lin, CD90/B220/CD49b/NK1.1/Ly-6G. Histograms on right depict the level of Ly-6C expression in respective populations. A representative experiment of 5 is shown. Tx, transplantation. (B) Time course of myeloid cell presence in heart and blood of allograft (black circles) and isograft (white circles) recipients. Animals receiving no transplants served as controls. (C) Ratio of Ly-6Chi vs. Ly-6Clo monocytes in the native heart, in isografts and allografts, and in blood. Data are shown as mean ± SEM; n = 3–5 per group.